The 87th death anniversary of Haipou Jadonang, a freedom fighter was observed at various places on Wednesday. Manipur Chief Minister N Biren Singh attended the 87th Martyrdom of Haipou Jadonang at Leishangkhong Kabui village in Manipur’s Imphal West district. Wangoi MLA O Lukhoi, Zeliangrong Baudi (Assam Manipur Nagaland) Athuan Abonmei and others also attended the death anniversary function. He added, “The Government is constructing a Water Supply Scheme worth Rs 40 crore in Tamenglong district. The Rani Gaidinliu Women’s Market at Tamenglong headquarters will be inaugurated in the last week of September this year. He also informed that the State Cabinet had decided to officially name the JNIMS road as Pukhrambam Kajao Road and Lamphel to Shija Hospital Road as Chirai Naga Road. “The Government will consider to declare August 29 as a State holiday and the State Cabinet will thoroughly discuss the matter in this regard,” he further said. 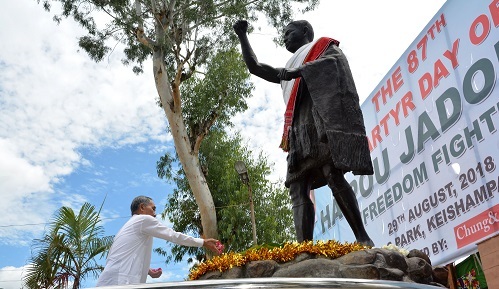 On the other hand, Manipur Deputy Chief Minister Yumnam Joykumar Singh and Health Minister L Jayantakumar Singh led the people to pay floral tribute to the Statue of the departed freedom fighter at the Haipou Jadonang memorial Park at Keishampat in the heart of Imphal town. A 2-minute silence was also observed as a mark of respect to the departed soul. In his speech, Deputy chief minister Joykumar said applauded the Freedom Fighter as a true nationalist, a reformist and far sighted fighter. Sekmai MLA H Dingo, former minister Kh Loken, president, Zelaingrong Union (AMN) Amu Kamei and leaders of various civil society organisations and people from different parts of the state attended the anniversary day observation. Most of the speakers in the said observation shared the heroic contributions and movements made by Haipou Jadonang to regain sovereignty from the mighty British Raj of those days. Zeliaangrong Union (Assam Manipur Nagaland), All Manipur United Clubs Organisation and United Committee Manipur jointly submitted a memorandum to the government urging to declare Haipou Jadonang Death Anniversary day as State holiday and to observe the day as State Function.There are also reports observing the day at other parts of the region.